It was built around 1872-1884 by order of Nasirol-Mulk, the aristocrat of Shiraz. 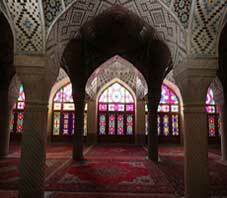 The mosque is the essence of Iranian art and architecture. The ceiling has fine stalactite molding plus beautiful tilework, and colourful windows.